2) 2016: Groundbreaking Ceremony of the Curaçao International Airport Terminal Expansion Project. 3) 2016: Inauguration Arrivals Hall and inauguration of airport food&beverages services and stores. CAP now also provides a safer landside flow, as the ‘road’ right in front of the airport has been adjusted into a boulevard for pedestrians. Families, kids, airport employees and users can safely enjoy this area of the airport, while having a clear overview of the surroundings. The Terminal Expansion Project is a crucial component of the Airport Expansion Project. The SPANTENBIER of the expanded eastern part of the terminal marks yet another important milestone in the Airport Expansion Project. Important partner in this development is governmental company Curaçao Airport Holding, which is also investing significantly in the realization of the Terminal Expansion Project. Following this milestone, we will continue with the development of the terminal, which when inaugurated, will have doubled the Departure waiting area. In addition to a more spacious area for arriving, departing and transit passengers, Curaçao International Airport will gain an additional bridge that will be able to accommodate process and offer services to large wide-body aircrafts. In addition, a second Mirador will be placed on the expanded part of the Terminal, ideal for enjoying plane spotting with family and friends or for photography. CAP realizes the impact the airport developments have on Curaçao’s economy, and as the airport operator is committed to jointly offer an enhanced and improved facility and service, positioning Curaçao as a more competitive airport in the Caribbean region. The start date of the complete construction work for the Terminal Expansion Project [terminal and continuation with the expansion of the middle part of the airport] was the second Quarter of 2016. The end date of the complete construction work (including new immigration Departures area) is set in December 2018. The start date of the terminal expansion/bridge construction work was June 2016. The end date [read: the date the terminal will be operational) is set for January 2018. When the Terminal area is operational, CAP and CAH will have offered more space (double the capacity) in the waiting area with facilities that enhance the comfort and experience of the traveler as well as more shopping and food & beverage facilities. CAP will also be able to offer a 6th bridge for major wide body airplanes. Here after CAP will continue with the expansion which includes separate routes for arriving or transit passengers and a new spacious area for Departing Area Immigration among others. The aim is to be able to process 2.5 Million travelers. Curaçao Airport Partners (private company) invests 25 million dollars in the Terminal Expansion. 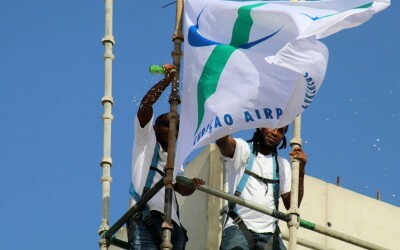 CAH also invested an additional 10 million dollars in the Terminal Expansion Project..